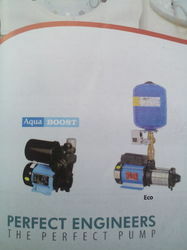 Our range of products include bathroom shower pressure boosting pump, pressure booster pumps, shower booster pump, pressure boosting pumps, grundfos pressure booster pumps and dharani domestic pressure boosting systems. 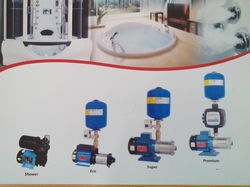 DHARANI Shower Water Pump Owing to rich industrial experience in this domain, we are involved in offering a supreme quality range of Shower Water Pump to our clients. This product is made with fine quality of material and designed by expert professionals. 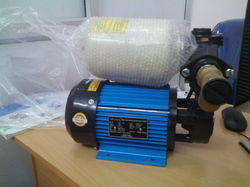 We are providing this product in bulk. Up to 5 bath rooms, kitchen and limited utility. 1 Special shower Max. Operating Pressure 3.5 Bar. 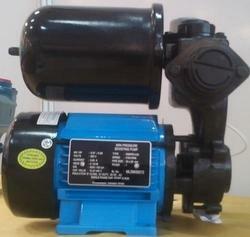 We are well known name in this business, engaged in offering a wide range of Pressure Boosting Pump to our clients. This product is extensively used in different Types of Shower and Taps various applications. Our products are tested on different quality parameter as per norms set by industries. 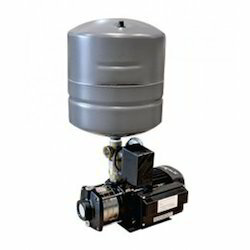 Counted as one of the renowned traders, suppliers and distributors we provide a wide range of Grundfos Pressure Booster Pumps. These find their wide application in various industries to maintain pressurized water flow at the outlets while consuming minimum energy. These products are manufactured by experienced engineers using finest quality components and following international industrial standards. Being the market leader, we are actively devoted towards providing well tested Pressure Booster Pump System. For fully automatic water supply in inlet mode, either from the public water supply network or from a tank. Pumping of drinking water, process water, cooling water, fire water (apart from fire-extinguishing systems in accordance with DIN 14462 and with the approval of the local fire safety authorities) or other types of industrial water that do not attack the materials either chemically or mechanically and do not contain abrasive or long-fibre constituents.